The detector Soldi 150 checks both the UV and white light features of banknotes. The sole verification of UV features is no longer sufficient for a protection against counterfeit money. The model Soldi 150 has a 9 watt white light lamp to help check other security features, for example, the watermark. 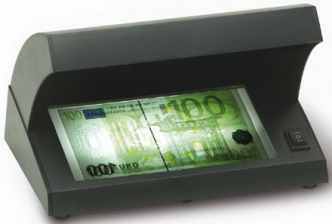 The wide opening of this device allows a fast and discreet detection of counterfeit banknotes. The Soldi 120 checks the UV features of banknotes fast and easy. 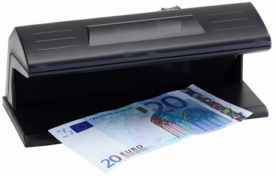 The high-performance 9 watt UV lamp makes the UV features of banknotes and documents visible.